Everyday speech-language pathologists in the schools adapt therapy to the students' curricular needs. A speech-language pathologist must be a jack of all trades. He or she must know about science, art, math, language arts, gym, computers, foreign language, history, and so on. The Quirkles books are perfect for working on science curriculum in the speech-language therapy room! The Quirkles books are all about "exploring phonics through science", and that is definitely apparent when you read them! These books are available in hard and soft cover format and now on the iPad! 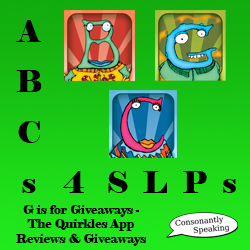 Continue reading for my review of how to use The Quirkles apps in speech-language therapy and for a giveaway of some of their applications! The "Quirkles" are introduced at the beginning of each application via text and a video. They come from a planet named "Quirk" where they are scientists who love to experiment. One day, the king of Quirk asked the Quirkles to travel to a new land called "Boresville". They were asked to share their discoveries with the creatures that lived there because they lacked imagination and knowledge. Soon, the twenty-six Quirkles (letters of the alphabet whose names are related to scientific topics) made friends with the creatures of "Boresville" and they were inspired to change the name of their land to "Quirksville" in honor of their friendship. The "Main Page" of each Quirkles application has six button options on it - Read, Recording, Science, Games, More, and Info. Pressing the circle button in the top right hand corner of the application will bring you to the "Info" page. Here, you will learn about how the Quirkles were created, the intended use of the books/application, and information about science safety. There are also buttons to go to the Quirkles websites for News, to get the Quirkles books on their store website, the ability to gift an app, visit the Quirkles' Facebook page, and follow the Quirkles on Twitter. Each application will have science experiments to go along with the scientific topic associated with the letter in the book. There will be materials, procedures, safety information, objectives, and conclusions for each experiment shown. Flip through the pages by swiping to the left or right. The Science pages also include fun facts about the topic associated with the letter in the book. Finally, there are links to free experiments, get the books, or watch The Quirkles on YouTube. 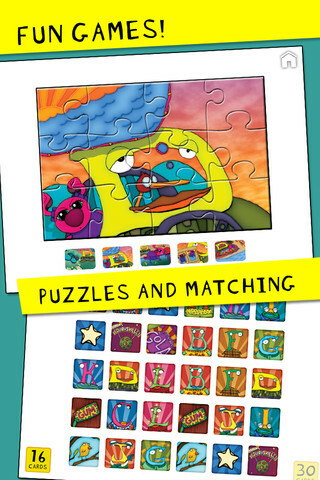 Each Quirkles application includes three games - matching, puzzles, and coloring. Matching - The matching game includes elements from the current book and other Quirkle books. It is played by pressing on two cards at a time. The cards selected will be flipped over to show images underneath. The child must match the cards in pairs to win. You can choose between 16 and 30 cards to play. Puzzles - There are puzzles based on scenes from the current application. Choose which image you would like to play the puzzle for at the bottom of the screen. Then, press the puzzle itself to disperse the pieces. Press, hold, and drag the pieces into place until you have finished the puzzle. If a piece is in the correct place, it will stay there, connect with the other pieces, and make a sound. The music will begin to play again once you have completed the puzzle. Coloring - Choose a coloring scene from the current application by pressing the "Change" button until you find the one you want. Then, press the color crayon you wish to use. Next, determine the size of the crayon used by pressing on the gray crayons on the left hand side of the application. You can choose the accuracy of coloring/amount the coloring page is shown by pressing one of the stars on the left. On the right hand side of the page, you can press the "Clear" button to erase all of your coloring. Finally, if you or your child wishes to save the image to the iPad, press the save button. The "More" page will show you the current Quirkles applications. You can also sign up for app updates and a free monthly newsletter with fun science activities! E-mail Icon - Allows you to share the application via e-mail with your friends. Home Icon - Pressing this will bring you back to the "Main Page"
You can either read through the book without recording your voice, while recording your voice, or while listening to a previous recording. If you do not wish to record or listen to a recording, press "Read". Otherwise, press "Recording" and a pop-up menu will appear. This menu will allow you to either create a new recording by pressing "Create New" or listen to a previous recording by pressing "Read to Me". Press "Create New" to record a students' voice while reading the book. Tap each image and then press the "Record" button to begin recording. The text of the page will appear in white font at the top of the application page. Scroll down to view more text. Press the "Stop" button to stop the recording. You can re-record by pressing the "Re-Record" button (you can do this as many times as you would like). Press the "Play" button to listen to the recording and "Pause" if you wish to pause the recording. Press the next page to record it. Once the student is done recording, he or she is now able to listen to himself or herself reading the book! Press the "Read to Me" button to hear the student reading while looking at the book. You must still turn the pages. Students can read through the book by pressing the "Read" button. This will show the pages without a speech recording playing in the background. A student can still read the application aloud, the teacher can read it to his or her class, or students can read silently to themselves. Make sure that you have the application oriented properly with the "Home" button on the right hand side so that page-turning is natural. Turn the pages by swiping right to left (or the opposite if your application is oriented the wrong way). Each story has multiple words with the beginning sound of the letter showcased on the front of the book in each sentence. There are at least three sentences per page. Character names begin with the letter of the alphabet featured and also have to do with a scientific topic. 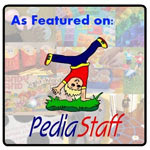 Each story showcases a different scientific topic, vocabulary, fun facts, an experiment, and more! Each book and application is associated with a letter of the alphabet. Characters also are shaped like their letter and have names with their beginning letter sound! The text of the books include a significant amount of scientific vocabulary and information. In addition, multiple words per sentence begin with the associated letter featured in the application! You can have students record their voice to hear themselves reading the application! There are additional creative games and experiments to have the children try! This allows them to participate in hands-on learning! The illustrations of the application are phenomenal with images of vocabulary related to the associated letter in the application. The application includes safety precautions to make sure that students are careful when participating in experiments. I love that students can record their own voices; however, many of my students have difficulty reading. If someone who can read is not there to read the book to them, then they cannot read it on their own. I would like it if there were a third option to listen to a pre-recorded, professional narrating the entire application. Expressive Language - Have students create more characters and name more objects that begin with the letter in the application! They can add on to the story at the end. Another idea is to have students re-tell the story. Receptive Language - There is a lot of great vocabulary in this application, especially related to science. Discuss the different vocabulary terms and make sure to include the regular spelling of any words that were changed for the application (i.e. "gola" = "cola"). Have students sequence the story in order by printing some of the scenes on cards. Inferencing - Have students guess what will happen next in the book. You can also have students guess what the conclusion of an experiment will be. Questions - Ask questions about the story, scientific vocabulary, what students think will happen next, characters, and more. Emotions - Discuss what emotions the characters have throughout the story. Look at non-verbal language via the illustrations as well as what is stated by the characters. Problem Solving - If there is a problem in the book, discuss what can be done to fix the problem. Turn-Taking - Students can take turns recording or reading pages on the application. Articulation/Fluency/Voice - Students can read the book and record their voices. Make sure to point out any words with their speech sounds and any strategies for better speech production ahead of time. Then, record their speech and play back the entire book. Each book is related to a letter of the alphabet, so if a student is working on a specific sound, have him or her read the associated book. This way, there will be plenty of opportunities for the student to read his or her sound in words in paragraphs! RtI - Since these books include phonics, have students point to different objects on the application that begin with the letter sound associated with the book. Have students identify the letter associated with the book in the text. You can zoom in if the text is difficult to read or point to. 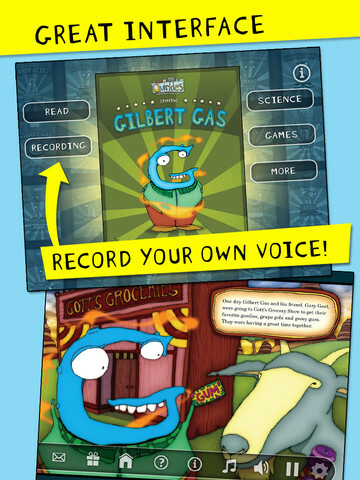 The Quirkles books are available for $9.99 each for the iPod Touch, iPhone, and iPad. 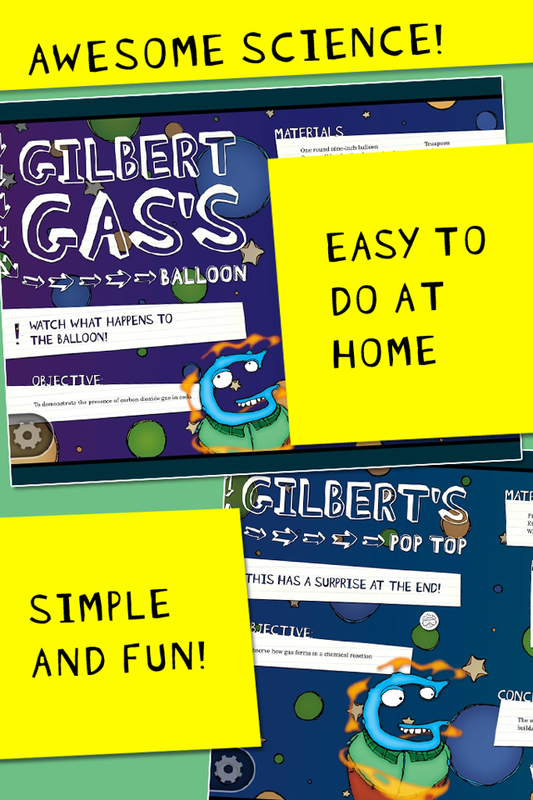 The Quirkles website includes YouTube videos of various experiments, get a sample book of Gilbert Gas, look through the newsletters for free downloads of coloring pages/worksheets to use in conjunction with the books, purchase the books/teacher guides/experiment kits, and more! The author of Consonantly Speaking received a copy of the "Gilbert Gas" application for review on APPreciation on Facebook. 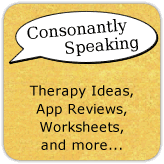 Consonantly Speaking was given application codes to give away for this review by The Quirkles. No other form of compensation was given. To enter giveaways for a few of The Quirkles books to use with your clients, students, or children, enter the giveaway below!